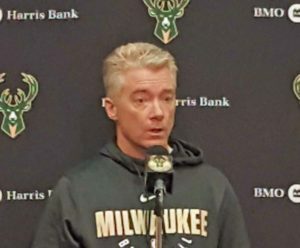 Former Milwaukee Bucks assistants Joe Prunty and Greg Foster have found new homes. According to ESPN, Prunty, who finished the season as interim head coach and led the Bucks to a 21-16 record to close out the regular season, will become the lead assistant of the Phoenix Suns. He joins the staff of new Suns head coach Igor Kokoskov. Foster is reportedly joining the staff of first year head coach Lloyd Pierce in Atlanta. Prunty interviewed for the Bucks head coaching job, but they went with former Hawks coach Mike Budenholzer instead.